In yoga studios worldwide, would-be yogis and yoginis chant kirtans to Him. In the West, His image is seen on everything from t-shirts to bumper stickers. But Shri Ganesh, the benevolent elephant-headed god with the pudgy man/child body is much more than the happy-go-lucky deity invoked for good luck and removal of obstacles along life's path. Ganesh is considered the Gatekeeper to the Vedas. Ganesh gained this status after engaging in a race with His brother, Murugan, to see which could circumambulate the universe fastest. Murugan dashed forth, leaving the pudgy Ganesh behind. But Ganesh won the race by simply circling His parents, Shiva and Parvati, the source of the entire universe, three times. As with many of the Ganesh tales, this one demonstrates why He is invoked at the start of any endeavor, i.e., if one wants success, he must acknowledge the highest value first. There never was a religion identified as 'Hinduism' until the British Raj determined that the beliefs and practices of the Hindu people - gleaned from millennia of collective wisdom, rather than from a single sage - constituted a religion. In fact, the Hindu people clearly recognize only one transcendent God from which all creation emanates. They simply identify their myriad devatas - major and minor deities - as embodiments of individual qualities and attributes who instruct or offer assistance to those seeking knowledge and a moral life. Additionally, religious scholars explain that in both the East and West - from the Greek Dionysian cults to the monotheistic religions - these same 'beings' exist under another name: 'angels.' In several traditions angels represent the male and female counterpart of similar principles to those of the devas. Because Ganesh's parents, Shiva and Parvati, represent the male and female power in the universe that brings forth all of the Creation, it's no wonder then that Ganesh, is considered the leader of all the celestial beings. If, as the Bible states, we are made in the image of God, there is one very striking similarity between the image of Ganesh and our human body. As noted by neuroscientist Dr. Tony Nader (now known as Raja Raam, and author of Human Physiology, Expression of Veda and the Vedic Literature), the lobes, brainstem and spinal cord of the human body bear a remarkable resemblance to Ganesh's ears and trunk. He is the most beloved and frequently invoked of the Hindu pantheon, and His worship unites all sub sects throughout Indian culture. Among His many qualities and appellations He is known as the Remover of Obstacles, although He will also hold back a devotee if the time is not auspicious or the devotee is not yet 'ripe' for fulfillment of a request. He is also called the protector of women, the Lord of meditation and the protector of the weak. He associated with the mystic symbol OM or AUM, the primordial sound used at the beginning and end of meditation, which is why He is invoked at the beginning of any new endeavor. Hindu children are taught a prayer to Ganesh, the source of all knowledge, before learning any subject, and He is also associated with the first word, Vaak, the sound whispered in the ear of a newborn to ensure the child will be endowed with sweet speech. Astrologically, as the chief God for Knowledge and Wisdom He is the overlord of the planet Ketu, known as the first planet, which some say is the most powerful planet among the all the nine planets as Ketu governs wisdom and liberation. Although known as a folk deity worshiped by and recognized in sects throughout India as early as 1200 BC, the image by which we know Him did not become widely evident until the fourth century A.D. when story of His birth first appeared in the Puranic literature. That story varies depending upon the oral history of each culture that tells it, but they share some common themes. In one tale, Parvati greatly desired a child, but Shiva wanted no part of the householder life. Distraught, she pulled a thread from her dress and from it fashioned a child. Shiva proclaimed such a flimsy birth inauspicious, at which the child's head fell off, leaving Parvati grief-stricken. A voice from the heavens told them to find someone whose head was facing north (a recurring theme from all the Ganesh origin tales) and Nandi, Shiva's bull, discovered Indra's elephant, Airavata, lying with his head facing north. The bull cut it off, Indra attempted to stop him and in the process cut off one of His tusks, but Nandi persisted, and the head was brought to Shiva, who placed it on the child. Ganesh was restored and His re-birth declared auspicious. In another tale, Parvati desires privacy at her bath and so constructs Ganesh out of a combination of the dirt on her body and perfume, and asks Him to guard the entrance to her chamber. When Shiva approaches Parvati's chamber, Ganesh refuses him entrance at which Shiva chops off His head. Here again, to assuage Parvati's grief he sets his ganas - the hordes of ghosts and ghouls who accompany him -- out to find the first being whose head is facing north, which is an elephant. In yet another Puranic tale, He was created by Shiva at the request of the minor devas to protect them against the demons. Parvati, besotted with the beautiful child, drew Him to her lap and declared that no endeavor would be successful unless Ganesh was honored. In many Eastern countries, all elephants are thought to represent Ganesh. By analyzing the qualities represented by the elephant and identifying some of the many tools and objects Ganesh holds or that are associated with Him, we can better understand why He is considered the gatekeeper to higher knowledge. An elephant can trample anything in its path but its efficient and flexible trunk can pick up even the tiniest object. It can be slow, graceful and elegant or rapid and fierce. Its large ears imply the ability to hear everything and its small eyes imply concentration and focus. His large stomach digests all - the good and the bad - of life. His conch summons all to come and pray, and His goad prods the slothful. He holds one of His four hands in the pose of blessing to protect those on the spiritual path. His ax and other weapons cut away whatever harm might lie ahead and whatever wrongs might engulf the mind. A plate of laddus near Him invokes the rewards of living a wise life. The lotus flower represents beauty arising from the mud below. His conveyance is the lowliest of creatures, the rat who can carry Him into the smallest of places and whose senses (and ours) are kept under Ganesh's control. One of the most provocative images of Ganesh is that at the feet of Veda Vyasa, using His broken tusk to write (one story says He broke it off to use as His pen) the world's longest epic, the Mahabharata. Under the advice of Brahma, Vyasa asked Ganesh to be his scribe under the condition that He understood every thought and word completely before writing it down. Thus, even the telling of the story offers the wisdom that the Mahabharata should be listened to and understood slowly, to absorb and digest the full meaning. There are numerous mantras associated with Ganesh, each calling forth a different attribute which the invoker desires to propitiate. 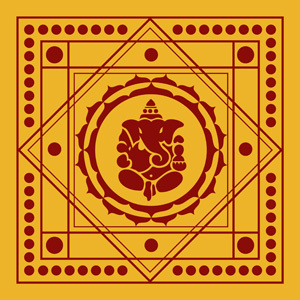 Although all mantra meditation requires some formal initiation it is particularly important when practicing a Ganesh mantra as these mantras are for developing specific siddhis or powers, and must not be invoked lightly or taken for granted. Finally, one of the most charming and instructive tales about Him involves Ganesh Chuthurti, the celebration beginning on the fourth day of the waxing moon, usually between mid-August and the end of? September, when Ganesh makes Himself available for all His devotees. The story is told that Ganesh rode His mouse to Chandra loka during the full moon but the mouse was frightened by a snake and bolted, tumbling Ganesh , at which the Moon burst out laughing. Ganesh became furious and pronounced a curse: ". . Because of your pride, no one may look at your face on Ganesh Chathurthi lest he be falsely implicated in slander and will lose his good name." Shattered, the Moon became humble, asking for forgivenenss: "Forgive me in my ignorance - please take back the curse," but Ganesh explained that once a curse is given it cannot be taken back. However, what was important was the destruction of the Moon's pride and as he had realized his fault - all those who are subjected to false accusations and lose their good name will be restored if they listen to this story. The Moon thanked Him humbly and Ganesh left Moon loka. And this perhaps is the most significant teaching of the Ganesh tales: that He will bless our endeavors and grant our requests if we first ask with thoughtfulness, humility and obeisance. Jai Ganesh! From the December 2011/January 2012 issue of Michael Laughrin's North American Jyotish Newsletter. Click to subscribe to this free Jyotish newsletter.